— Lieutenant Commander Peter Scott, 1943.
o doubt that like Lt Cmr Scott, many Britons living during either world war felt threatened by the very real possibility that their country, along with their liberty, could be snatched from them, and that their lives, together with their much loved countryside could be irrevocably changed. A sense of insecurity that fortunately most of us find impossible to imagine now. This anxiety, coupled with an awareness that rapid changes were taking place within farming and its technologies meant that many traditional ways of country life were rapidly changing and in many cases disappearing altogether. It would seem that many artists and illustrators felt the need to record and to express visually, similar sentiments to those expressed by Lt Cmr Scott. These national concerns of a disappearing Britain may go someway to help explain the proliferation of books produced between the wars (and shortly after) that graphically depict the subject of ‘the countryside’ and rural living. What’s striking about these titles is that the books were mostly illustrated rather than photographed, and more specifically they are mostly illustrated by means of wood engraving and to a lesser degree, scraperboard. 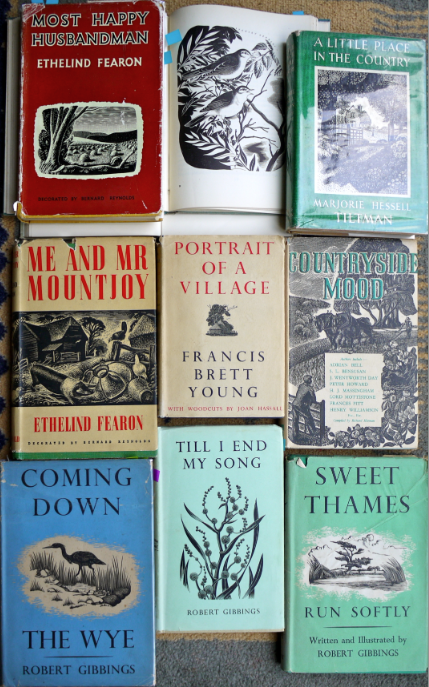 A sample of my own collection showing just some of the many beautifully illustrated books on the theme of the countryside. On looking at images such as the book cover of ‘Countryside Mood’, one might argue that these depictions of rural life are—and probably were at the time of publishing—a somewhat romanticised vision of Britain’s rural living. However, despite the nostalgic qualities that we might associate with the images, when one compares some of illustrations with the then contemporary photographs, it is clear to see that some of these images were not unrealistic snapshots of what one might see in going on in the busy, more heavily human powered, pre-WWII countryside. After all, despite advances in farming technology there were many more people farming the land than today and as such, the rural populace—particularly those who worked the land—would have undoubtedly had a far greater knowledge of country ways, possessing a sensitivity to the land and its seasonal rituals that most of it current inhabitants have—if only because it was necessitated by both war and the dictates of technology. 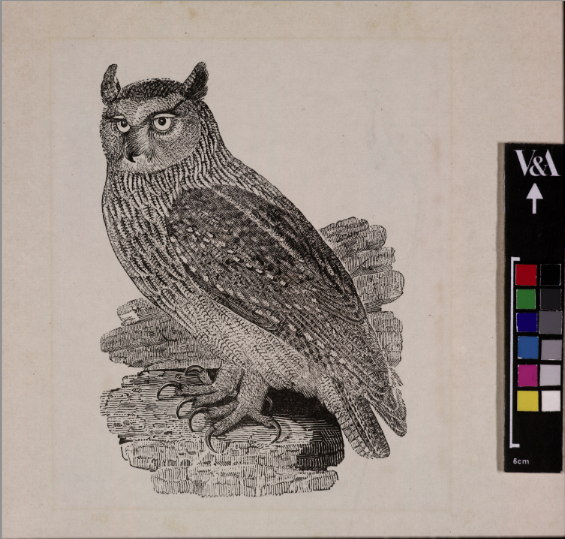 Due to copyright issues I am unable to reproduce Leighton’s printed works. 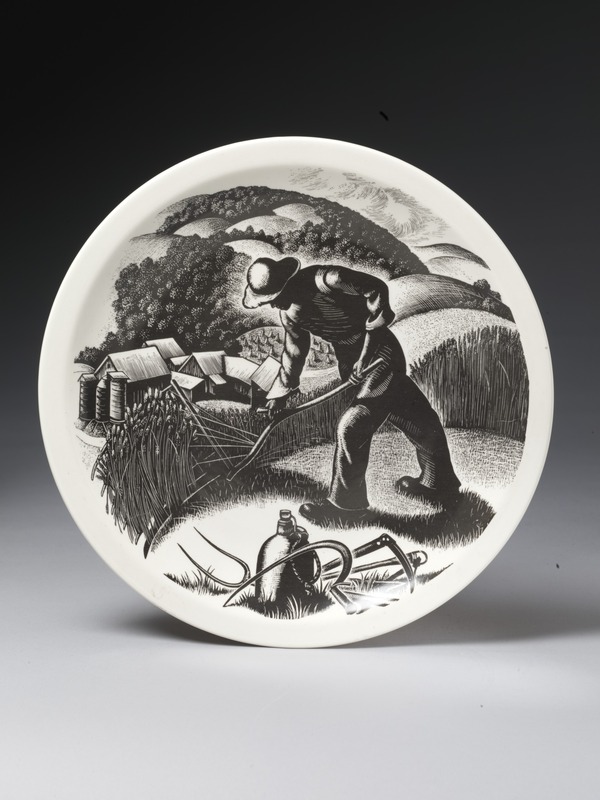 However, this image shows Leighton’s work on a Josiah Wedgwood and Sons’ ceramic from 1950, and depicts a rural scene typical of that created by Leighton and her contemporaries. From the mid 1950’s it would appear that there was a distinct and fairly rapid decline in the production of this genre of illustrated countryside books. One can only guess at why this happened. My guess is that the market simply became over saturated, ultimately causing interest to wane, and as illustrative themes and techniques move in and out of fashion, this genre simply ran its course and became outdated. Yet despite the rapid growth of digital illustration and the trend for depicting all things urban in recent years, I have noticed that there is something of a revival of the rural illustrative genre taking place. Perhaps once again, with the increased threat of our countryside disappearing, this time at the hand of would be green belt developers, we’ll see a resurgence in artists, illustrators and photographers wanting to record images of the country for posterity. Certainly the rural themes expressed as black and white illustrations are experiencing a certain amount of renewed interest, with some publishers wanting to echo the styles this bygone era. Some of the illustrated titles from Snake River Press echo these past styles of illustration whilst adding a contemporary twist. The incredible work of prolific Irish artist, sculptor and author, Robert Gibbings—another contemporary of Leighton and Miller Parker—has also seen his countryside titles reprinted in recent years. And as recently as 2009, Richard Harman’s ‘Countryside Mood’ was once again republished for a new generation to enjoy. Clare Leighton’s Wood Engravings of English Country Life between the Wars. Clare Leighton’s Art and Craft; Exploring Her Rich Legacy through the Pratt Collection.